Premium seating includes the field-level and club-level memberships at Audi Field. These membership types give fans the ultimate matchday experience with all-inclusive food and beverage as well as other VIP benefits. How many premium seats are available at Audi Field? 2,000 premium seats are available at Audi Field, comprised of 1,500 club and 500 field level seats. How much does premium seating cost? Please contact a member of our sales and service team today to learn about available pricing. Pricing is based on row and proximity to midfield. Why do I have to sign a multi-year agreement for premium seating? Multi-year agreements lock in your membership rate against future price increases throughout the duration of the agreement. What is the preview center? In 2016 D.C. United opened a state-of-the-art preview center in Union Market, designed with capabilities to illustrate all pertinent characteristics of the new building and surrounding area. Through 3D modeling and augmented reality, D.C. United fans are able to test drive the new matchday experience at Audi Field. Why should I visit the preview center? D.C. United encourage all fans to test drive Audi Field by scheduling a time to visit the preview center. Fans will be able to see the most updated renderings and through augmented reality select a seat that best suits their needs. What are the preview center hours? The preview center is open by appointment 7 days a week. Please contact a member of the D.C. United sales team by calling 202-587-5000. How many suites do you have available at Audi Field? 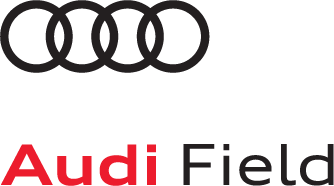 Audi Field has 31 luxury suites, with various locations and benefits to meet the needs of our community. How much do suites cost? Please contact a member of our sales and service team today to learn about available pricing. I have a business, can I use my suite on non-matchdays? Suite owners will be able to access their suites even on non-event days. Your account manager will be able to provide more information on accessing your suite on non-event days. How many seats are located in the supporter section at Audi Field? There are 1,500 seats with the ability to expand up to 2,000 seats. Which sections are for D.C. United supporters? Supporter sections are located in sections 136 and 137 in the North Stands, with the ability to expand into section 135. How many parking spots will be available? 6,500 parking spots will be located nearby. Will handicapped accessible parking be available at Audi Field? Audi Field will be fully ADA compliant. United will provide a complimentary shuttle to and from the accessible parking areas. What is the closest metro station to Audi Field? Fans are encouraged to arrive at Audi Field via the Navy Yard Metro Station (Green Line). It is less than a 10 minute walk. Will there be bike parking spaces? United will provide complimentary bike valet services on matchdays. Secure bike parking will also be available on the southwest corner of the stadium.